Preservation New Jersey applauds a recent developer’s proposed investment to revitalize downtown Flemington. This is a plan that is long overdue, has been stalled for many years, and has the potential to provide the type of mixed-use, 24/7 activity that will reestablish Flemington’s prominence in Hunterdon County and western New Jersey. 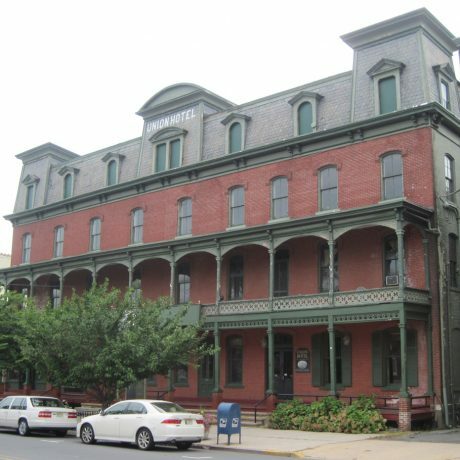 However, the plan proposes to demolish the heart of historic downtown Flemington, the landmark Union Hotel and the adjacent Victorian buildings along Main Street. Historic Flemington is much more than the recently restored 1828 courthouse, the site of the famed Lindbergh trial of 1935. It is more than just the Union Hotel where reporters drank and the jury was sequestered during the famous trial. Indeed, it is the coherency of the intact streetscape lining Main Street that gives Flemington its special character. Demolishing the Union Hotel and its neighbors will cut out the heart of the historic downtown, a policy decision which can never be reversed. This development would replace these nineteenth-century structures with a generic plan that could be found in any new development across the country. Preservation New Jersey strongly advocates that these existing buildings be incorporated into any new plan for the downtown. It is difficult to accept the statement by the developer “…if you try to preserve any one of those buildings, you can’t complete the vision.” Buildings in much more compromised conditions are restored and given new life all of the time. The hotel was only vacated in 2008; the other buildings are still occupied. There is an immense amount of experience and talent in the development and design communities to save historic buildings. The New Jersey Building Code has a specific Rehabilitation subcode to address this type of project. Listed on the National Register of Historic Places as part of the Flemington Historic District, the Union Hotel could qualify for substantial federal investment tax credits. The National Trust’s Main Street program can also assist in achieving these common goals while retaining the character and charm which uniquely defines Flemington, New Jersey by advising on the development plan and providing relevant examples of similar projects. Examples abound in New Jersey and across the nation of successful redevelopment plans, centered on their historic downtowns – Savannah, Georgia; Newberryport, Massachusetts; Portland, Maine; and closer to home – Clinton, Frenchtown, and Hopewell, New Jersey, among many others. These all retain the very specific characteristics of their history, legacy, and spirit that make these towns special, preserving their sense of place. All are economic successes and models of smart development, building upon the core of their historic downtowns. The Courthouse, the Union Hotel, and the adjacent Main Street buildings all reflect the history of Flemington as an important civic and commercial center of the 19th and 20th centuries. With a smart, preservation-minded redevelopment scheme, these buildings can be the centerpiece of a successful and lively business and entertainment district reflecting both the past and future of Flemington. If these buildings are demolished, this link to Flemington’s past will be lost forever, and the resulting plan will have destroyed the core character it was planned to enhance in the first place. We strongly urge the developer to redesign their plan to retain this important core of historic Flemington. Countless examples of main street revitalizations and adaptive building reuse have resulted in financially feasible and culturally responsible projects. Flemington New Jersey can be the latest in this long line of successes.